The Boa Snakes Worksheet – Download for FREE this fun printable science activity sheet for kids. This easy science word search worksheet is ideal for Pre-K kids, Kindergarten kids and Grammar school kids in Grades 1-5. Pre-K and Kindergarten kids can enjoy this free to download worksheet as a listening comprehension. Grammar & Elementary school kids will love this word seek puzzle game and can use it as a reading comprehension activity. Our Boa Snakes worksheet is a great way for kids to have fun while they learn all about boa snakes. EasyScienceforKids.com is a great free online teacher resource with many free printable activity sheets to download and fun facts for kids. Boa constrictor snakes are one of the large species of snakes with heavy bodies. Boa snakes are members of Boidae family that are nonpoisonous snakes. Boa snakes are considered some of the world’s most beautiful snakes. Boa snakes are stealthy hunters that live around the world in different kinds of habitats and blend into their surroundings. Download the Boa Snakes worksheet for more boa snake facts for kids! [sociallocker]Download the Boa Snakes word seek puzzle for kids. Download the FREE Boa Snakes Worksheet! Liked the FREE Boa snakes worksheet? Read lengthy boa snakes information here. Declan, Tobin. " 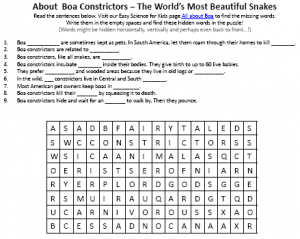 Boa Snakes Worksheet - Free Printable Word Search Puzzle Game for Kids - ." Easy Science for Kids, Apr 2019. Web. 25 Apr 2019. < https://easyscienceforkids.com/boa-snakes-worksheet-free-printable-word-search-puzzle-game-for-kids/ >.